TV wall composition. Frame in bent sheet steel for TV hanging with cable slots and extensible A/V cable cover with magnetic catch. Black phosphatized finish. Underframe in bent sheet steel for wall fitting of the panels. Shelves to be fitted into the panel made of laser cut steel plate, thickness 4 mm and depth 30 cm, epoxy painted embossed aluminium. 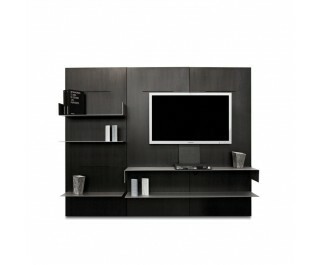 Composition of 2 panels + cable slot and cover + 1 double shelf with two folds + 1 double straight shelf.